My vision for the future of our nation is simple. I want words to survive – for language to endure in a meaningful way. I envision an air of quietly reading stone tablets iPads in togas by a glimmering fountain – for ideas to be shared and expressed with esteem, poise, and respect. I remember playing Star Wars with a childhood friend. We’d always fight over who got to be Darth Vader. Maybe it was the black mask, robes, and pleather gloves, or the easy, graceful manner in which he wielded his signature red saber, or that voice. We would monologue Vader’s lines from the movie as we acted out our negotiations. We tried to speak as if we were Jedi (or Sith, as it were) and more time was spent perfecting accents, tone, and inflection than fighting with our plastic light sabers. 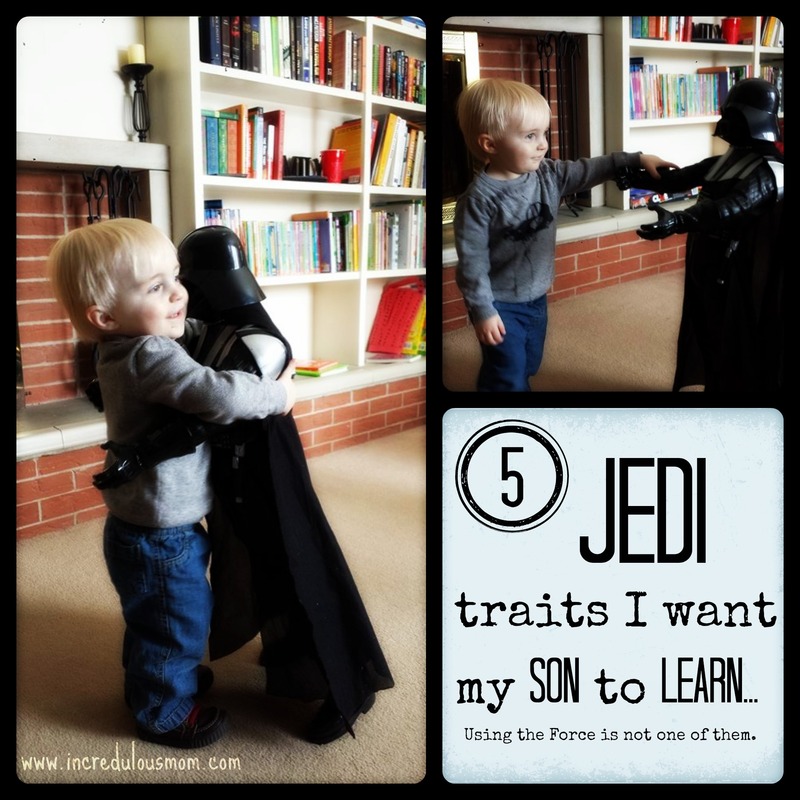 Every kid wants to be a Jedi (I’m including Vader here because he was a Jedi too, after all). Jedi are able to navigate difficulties with a sophistication that lets us know that they are well-read. Sure they use the Force. Sure they train relentlessly for battle. Sure they slice other beings in half with their light sabers. But all of this is done with an emphasis on self-respect, dignity, and etiquette. I have to go out on this limb…even Darth Vader possesses these qualities. As villains go, he speaks and fights with (albeit evil) grace and elegance. Nuance is wasted on youth, so kids don’t truly understand what it takes to be a Jedi – to separate themselves from the mindless, sheep herd of storm troopers, or the ignorant, foul culture that rages on inside Jabba’s desert barge. They don’t get how to become a Jedi – that it’s more than fighting. Lucky for my son, he was born into a household where his mother will ensure that “I’m a Jedi! You be Boba Fett!” or “I’m Darth Vader this time!” will be uttered at some point in our house. We love and embrace popularized fantasy books and movies in our home, and while there are many fun and promising pretend games, I want my son to learn the ways of the Force by realizing that there are subtle disciplines at play – not just swordplay or wand-wielding or ring-bearing. If you ask any Jedi, they’ll tell you: Reading is cool. It doesn’t matter if you’re a boy or girl, from Naboo or Tatooine, a true Jedi cannot be ignorant. Negotiations are far more about understanding your foe – their language, culture, tendencies – than wielding a light saber. Keeping peace requires knowledge far more than fierceness. The Jedi study more than battle tactics. They study astronomy, galactic history, social studies, and probably read the odd mystery or sci-fi thriller on occasion. You want to be a Jedi? Read a book – better yet, read many books. As Yoda would say: Read books, you must. Jedi can speak, write, spell, and use proper punctuation. OMG Jabbas at it again he is so mean makes me sick 2 my stumick he don’t even no watch ur backs! It is with disgust that we must report the resurgence of Jabba’s ruffians. Stay alert. May the Force be with you. Jedi are patient, kind, empathetic, accepting, and merciful. You’d be hard-pressed to find someone who would call a Jedi a “sissy,” yet Jedi show emotions. They love. And guess what…they cry. That’s right. Even Luke, who did the most honorable and badass thing of all when he helped Vader finally – finally – bring balance to the Force, bawled his bloody eyes out when Vader disclosed his parentage. And while his mask betrayed his emotions, you can bet that Vader’s tears ran freely as he watched Luke be tortured by the Emperor. Jedi care for the weak. They defend against bullies, because they feel for humanity and value life. They are not mindless droids. They use emotion to guide them on their mission. Their might is not a value of brutality, it is one of emotion. A Jedi will tell you: It’s ok to cry. It’s ok to show care and concern. They accept those who are different. If you look at the Jedi roster, you’ll see they are from all cultures, planets, and species. They harness their differences and learn from them rather than let them divide. And Jedi patience is unmatched. They recognize that they cannot change what they can’t control, and instead they try to understand, which may take time, some meditation, or a few deep breaths. Jedi are mindful of their actions. A Jedi does not act or speak without mindfulness. Even Obi Wan instructs Anakin, “Be mindful of your feelings.” There are no hurtful memes posted to their Facebook walls that ridicule Wookie culture. They would never post something snarky about the Galactic Left or Right. They would never post something insensitive toward someone’s race, religion, political views, or sexual orientation, because to do so would be heedless, tactless, and ineffectual with the side effect of hurting someone else, regardless of how they themselves feel or believe. They do not text naked pictures of themselves, and a Jedi would never take a drunk selfie. They hear and listen. The technology of the Empire in many ways surpassed what we have today, yet I’ve never seen a Jedi bump into a door frame because her face was glued to a smart phone. Jedi use technology conscientiously, and only when necessary. Anything else they view as waste. It is for these reasons that I want my son to get excited about being a Jedi, or even Vader, when we put paper towel roll to paper towel roll in mock battle someday. The trick will be idealizing these attributes in the same way that violence is glamorized in our culture. I’m hoping he’ll see that the way of the Jedi is difficult, but that what makes them special is not their light sabers, but their open minds and open hearts, Darth Vader included.